I have a new smoothie recipe for you! This is my Strawberry Green Smoothie. I don’t know about you, but I had indulged a lot over the holidays. So after Christmas was over, I decided to quit all sugar, including maple syrup, for a while. It was HARD, but I did it! Once I had been sugar free for 3 days, I started a really good smoothie cleanse. It’s called the 10-Day Green Smoothie Cleanse from JJ Smith. I really didn’t do it to cleanse, but more to re-set my body after eating all the junk. I LOVED it and it renewed my love for green smoothies again! It also inspired me to make this healthy smoothie recipe for you. I really enjoyed this particular cleanse because it allows you to snack in-between the smoothies. Some of the allowed snacks are nuts, seeds, fruits and veggies. You can also eat hard boiled eggs, but I didn’t because I am vegan. Another great discovery I made, was that water works just as well as almond milk when blending smoothies. I really didn’t even notice a difference! So I am using water from now on. 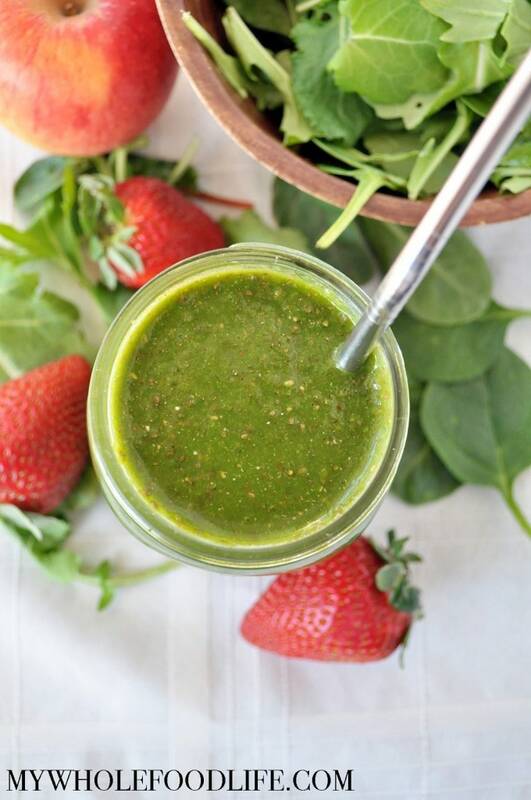 Get lots of greens in with this healthy smoothie recipe! In a blender , add the water and mixed greens. Blend well. Then add in the apple, strawberries and flax meal and blend another minute. Lastly, add the chia seeds and blend another minute. Pour into two 8-ounce jars. Serve immediately, or save for later. Both smoothies must be consumed within 24 hours. Enjoy! If the smoothie is not sweet enough for you, feel free to add more fruit. I was trying to keep the sugar count down, so I used the lower sugar fruits.